If, after installing Reporting Services you see a blank screen when trying to open Report Manager, you can try the below methods to get you moving. · Enable Integrated Windows Authentication in the Reports (and ReportServer) virtual directories in IIS, and disable Anonymous Access. · Try to open Report Manager. If your account is recognised as an Administrator, you should see more content in Report Manager. · Add the local anonymous IIS account (IUSR_MACHINENAME) to the Administrators group for the local machine (this is just temporary, read on). 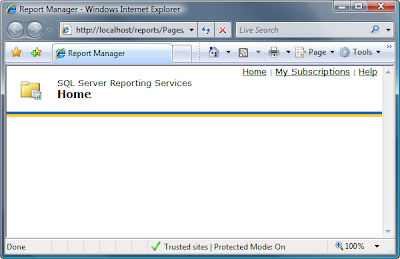 · Try to open Report Manager - you should now see full content. · Go to the Properties tab, and click New Role Assignment. Grant the IUSR_MACHINENAME account the appropriate privileges to access the Report Manager (be careful not to allow too much access since this means your users could change/delete reports). · Remove the IIS account from the Administrators group for the local machine. · Enable Anonymous Access for the Reporting Services virtual directories in IIS, and disable Integrated Windows Authentication. · You should now be able to see the appropriate content within Report Manager. I thought it might be useful to share my findings in case a Google search brings up these errors and the resolutions I found, since I eventually managed to get everything installed. Some people might have opposing views on the steps I took, but it works now and that's the main thing. Full Error Text (From Windows Event Viewer): "Product: Microsoft SQL Server 2005 -- Error 29559. SQL Server Setup failed to modify security permissions on service MSSQLServerADHelper for user V024755. To proceed, verify that the account and domain running SQL Server Setup exist, that the account running SQL Server Setup has administrator privileges, and that exists on the destination drive." Background: When attempting to install SQL Server, the following error appeared near the end of the installation when it was attempting to configure Database Services. Was connected to the installation machine over Remote Desktop (mstsc). Had initiall selected to install all of the desired SQL Server 2005 components, with all except database services installing succcessfully in this installation. Workaround: Logged onto machine directly rather than over mstsc. Checked that domain account was a member of the Adminstrators group. Removed all traces of SQL Server 2000 files from C:\Program Files\Microsoft SQL Server\80. Modified file permissions on all files and folders under that location to allow full control to the appropriate domain account. Result: The above error did not reappear, the installation proceeded past this point though another error was encountered. Full Error Text (From Windows Event Viewer): "Product: Microsoft SQL Server 2005 -- Error 29515. SQL Server Setup could not connect to the database service for server configuration. The error was: [Microsoft][SQL Native Client]Encryption not supported on the client. Refer to server error logs and setup logs for more information. For details on how to view setup logs, see "How to View Setup Log Files" in SQL Server Books Online." Background: After setup had proceeded past the point of error 29559 above, the installer was attempting to start the database engine service when the above error occurred. The suggestion was that the problem was caused by the fact that some SQL Server 2005 components (Integration Services, Visual Studio 2005 IDE etc) had installed successfully in the very first installation, so there was some kind of conflict caused. Workaround: Removed all traces of all SQL Server (2000 and 2005) installations to begin from a 'clean slate'. NOTE: Everything except Microsoft SQL Server Setup Support Files - you need this to complete 2005 uninstallation. If this does not appear in Add/Remove Programs, you can reinstall it by running SqlSupport.msi, located in the installation folders. - Removed everything related to SQL Server which was visible in Add/Remove Programs dialog. - Followed uninstall steps for SQL Server 2000 from Microsoft website. - Followed uninstall steps for SQL Server 2005 from Microsoft website. - Restarted installation, to install Database Services only. This was done with the goal of minimising risk by introducing installation of other components. Result: Installation was successful of Database Services. - Started installation of remaining components (Analysis Services, Reporting Services, Integration Services), without Database Services. Result: Installation of remaining components was successful. · Remove all instances of SQL Server 2000 before you do any installation of SQL Server 2005 whatsoever, do not attempt to upgrade if at all possible. · Ensure you have administrator privileges on the machine where SQL Server is being installed. · Install Database Services first, before any other components. · Once installation of Database Services is successful, then install remaining components. I'm in London and I've been trying to establish a remote connection to another machine which I use for development. I needed to access it so that I could work remotely while away, but when connecting using Remote Desktop (mstsc on the command line) I could see the log in dialog and enter my details, but as soon as I pressed 'OK' it just quit. No error messages, nothing! I tried using the IP address, and the fully qualified hostname but no cigar. What drove me even more mad was that I previously tested that I could connect to the machine when the laptop and desktop were physically right next to each other. But as soon as I moved away from the same location, I found I was unable to connect. I thought it was something to do with trying to connect to it from another IP subnet, but I managed to connect remotely to a third machine which was on the same subnet, and from there I still could not connect to the target machine. I thought it was odd that I could connect to one machine, but not the other. So I did a search of the Microsoft support website, and it turns out that the problem is a dodgy NVIDIA display driver! Apparently it doesn't like people connecting remotely, so it just decides to kill the connection with no error and no warning. See this support article: http://support.microsoft.com/kb/886212/en-us which suggests rolling back your NVIDIA driver. But in the short term, if you have an NVIDIA graphics card and if this problem has been driving you mad and you are unable to roll the driver back, hopefully this will help. I think the problem is due to the multiple monitor functionality that comes with the NVIDIA driver software. So if you have that enabled, then this might help. For me, that meant Bob was my Uncle. But it remains to be seen if I can disconnect and then reconnect to my session on the remote PC.